Permanent cosmetic makeup is technically classified as cosmetic tattooing. Permanent makeup machines use micro pigmentation or demographics to deposit colored pigment into the upper reticular layer of you or your client's skin. A skilled permanent cosmetic technician can have a lucrative and rewarding career if they work with a high-quality permanent makeup machine. It is a growing industry and a lucrative way to monetize your spa or wellness clinic. Perma﻿﻿n﻿﻿ent makeup machines can be an exceptional addition to a beauty spas service line. Let's take a look at some of the best-selling permit making machines on the market today. If you want some non-Amazon alternatives, NPM USA sells several permanent makeup machines. The good thing about them, you can contact support to get some customized advice about the best option to buy. Once you visit the site, just click on the chat icon on the bottom right corner of the screen, or use the "Contact Us" link in the menu to get advice about purchasing options. According to their site, they offer "the most advanced permanent makeup and micro pigmentation machines available.We leverage the latest technology to bring you the tools you need to consistently create permanent makeup artistry." You can watch a YouTube video of their products in action below. It demonstrates how a professionally trained permanent makeup artists create permanently colored lips with a NPM-USA permanent makeup product. How Is Permanent Cosmetic Makeup Applied? There are a variety of ways that permanent makeup cosmetics can be applied. Many men and women explore permanent makeup machines to get permanent eyeliner as well as lip lines. Cosmetic professionals sometimes use tattoo coil machines; rotary, digital or pen machines; or just by hand. Generally a permanent cosmetic make up artist will consult with a client about what they're looking for. When they have agreed on goals, the permanent cosmetic artist will supply pigment and do the actual cosmetic tattooing. Follow-ups are required to touch up the make up, ensuring that the design and color of the pigment is maintained. One woman writing in the realself.com forum said that the first permanent makeup application for eyeliner didn't hurt, but the beauty salon used the permanent makeup machine in conjunction with a numbing gel that made the next few passes much less painful. Another user writes that when she had her eyebrows permanently made up, but it was extremely painful and shout like her skin was being grounded off. Lidocaine injections did help her somewhat, but she did say that overall it was a bit of a painful experience. Another woman writes that she has had her eyebrows retouched every so often with a permanent makeup machine and that they were pretty painful to have done even with the numbing agent. However, when she had her lips drawn at a cosmetic clinic, a dentist gave her a highly effective numbing agent so that the permanent makeup machine didn't cause too much pain when she got her lips permanently made up. Yet another user writes that she was given a sedative at her salon when her eyeliner was permanently applied however she did say that it was pretty painful, nonetheless. Overall it seems that the general consensus is that this can be a highly painful procedure. If it's possible, you should use a numbing agent as well as a sedative if you are permanently making up a customer, or if you are a customer looking to have your makeup permanently applied. As a salon owner, it's imperative to clearly communicate the potential painfulness the procedure. Many men and women have undergone the process were clearly not prepared for the extent of the pain as well as the necessity of return visits to touch up their permanent makeup. Who is permanent make up for? Is cosmetic tattooing actually permanent? Since the pigment is tattooed into your upper reticular dermal layer it can't be washed off. Though as you have probably noticed that many people with tattoos have faded pigmentation, the same issue will over time wash out the coloration. While fading will often occur, this is why it's important to receive periodic maintenance which professional cosmetic tattoo artists often refer to as color refreshing or color enhancement. Imagine a wooden desk subject to the sun- over time you will notice that the wood finish will blanch and fade. It's really the same thing with the pigmentation on your skin. That's not necessarily a bad thing, however. As you age it's likely that your makeup preferences will change and evolve. As well, your skin and physical appearance will also modify and you may wish to change up the permanent make up anyway. When you need to update your permanent makeup, take the time to consult with the technician about your changing permanent makeup needs and reevaluate your appearance profile to get the best look for you. It's important to note that pigmentation longevity will vary by individual to individual. 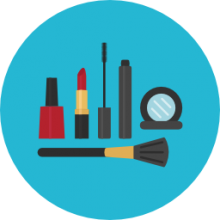 Most trained cosmetic professionals are certified by the Occupational Safety and Health Administration and use proper sterilization and disinfection. Some of the important criteria include the use of new and sterile needles for each client. Disposable aprons and gloves should be used for each client. A technician should also adhere to high hygienic personal standards. The bed and chair covering should be disposed after each use and the treatment room should be kept clean at all contaminants. Commonly eyebrows do not demonstrate any ill after effects from treatment. However there may be moderate swelling if you have eyeliner and lip make up permanently applied. This will, of course, depends on your own sensitivities as well as the extent of the work was performed. For example, merely having lip liner permanently applied will show more minor aftereffects than if you had full color permanently applied. Everybody is different-and skin sensitivities very greatly between clients. Bruising can also occur but is generally fairly minor and commonly subsides in a couple of days. Tenderness is also another common symptom that also will fade with time. A common concern is that the color initially will be here much sharper than anticipated but it will normalize within the first 6 to 10 days. If you're looking to purchase a permanent makeup machine- check out our comparison table above. Make sure you check out the product pages to get some additional product specifications and examine the warranty information to ensure that you can return your cosmetic machine if it's not a fit for your professional spa.